Do you want your club to grow? Pretend, just for a moment, you are new to your City. First time amateur radio visitors may try to find a club or may search for the local repeater listings. Failing there, the searcher may try to check the local media or check with the local Chamber of Commerce for clubs. Did the local club announce their meeting in the newspaper? Was there a press release sent to the radio station? If the answer was "No", then what chance is there the visitor may discover the meeting time and place? Did the press release mention the topics of discussion? If the answer was "No", what chance is there the visitor would be interested in attending? Did the club send a press release announcing what happened at the club meeting? If the answer was "No", what chance is there that the public is doing to learn what club projects and activity are occurring? While there is a LOT of competition for News Editors and Producers eyes, it is guaranteed ... very sure ... 100% likely ... the press release will never get used, if the press release is not sent. If your club lacks a public information officer, please reach out to the Public Information Coordinator in your section. That person wishes to help you get a PIO, but, until one is selected, can help with your press needs. Go to the West Gulf Division web site at www.arrlwgd.org and read the article on the front page regarding a nomination(s) of some Oklahoma ham. We all know that there are members of your club that have worked and sacrificed for amateur radio. Many have been doing outstanding work for amateur radio and we need to recognize them. They deserve this recognition and there is nothing better than receiving this award from their peers. The nomination form can be found in the article mentioned above. Go to www.arrlwgd.org and send your nomination(s) in by April 15. Winners will be honored at the Ham-Com 2013 Convention in Plano TX, June 7 and 8th. Here's your Oklahoma Section News! We've had a great start to the hamfest season here in Oklahoma! Eddie and I had a great time in Moreland back on the first weekend in February. Great hams, great hospitality and great deals, what more could you ask for. You need to try and make it next year. I didn't get to make it to Elk City, but I understand they had a great timd as well. Green Country is in the books and I can say it was wonderful as usual. It did seem that the numbers were down some this year, but I though Friday evening was better than in the past. We go to play host to Chuck Skolaut, K0BOG and his wife Mary (I forgot her call). Chuck gave a good talk on the Official Observer program. If there is anyone in the section that would be interested in becomng an OO, let me know. Also in attendance was our Vice-Director, John Stratton, N5AUS and my wife Wilma, W5WRO. John had one of the best talks on the League's Advocacy that I have ever heard. Wilma, with Mary's help manned the League booth while Chuck, John and I shook hands and generally mingled with members. The booth generated 31 new or renewal memberships. Speaking of memberships, if you either join or renew at the league booth, we have some nice premiums for you to choose from. The usual Repeater Directory, More Wire Antenna Classics, Hints & Kinks (New), Small Antennas for Small Spaces (New) and the 2012 Periodicals Collection. The last item is really pretty neat. It is the entire year of QST, QEX and NCJ on CD. They are all in PDF format and fully searchable. So sign up at the booth. We're having another "Ham-Aid"!!! It will be on Saturday, 20 April at the Salvation Army Citadel, 1 blk west of SE 44th & Bryant. Tentative start time is 9:00 AM. This will also be a follow-up to the Marathon Pre-Briefing for those who can't make the regular briefing on Tuesday,16 April. The various activities are still being developed. If you have a request or suggestion for an event or activity at 'Ham-Aide" contact Dave, NE5S. One activity will be helping folks program HT/mobile rig for the 2013 Oklahoma City Memorial Marathon. Please bring your software and cable!!! 9/13 - 9/14 Ada Hamfest, Ada, OK???? While the first two awards are self explanatory, the third award represents any Amateur Radio endeavor that the nominators feel deserves recognition. Suggested categories can be found on the Division website. www.arrlwgd.org They include Educator of the Year, Radio Scouter of the Year, Technical Achievement and Amateur Radio Organization of the Year among many others. For the WGD Excellence Award only, the nominators are not limited to the suggested categories. least three ARRL members on the award nomination form, a minimum 150-word statement and any available supporting documentation. Other rules do apply and can be found on the WGD website at www.ARRLWGD.org. appoint his/herself to the committee. The fifth judge is selected by the Division Director and may reside anywhere within the West Gulf Division. Neither the Division Director nor the Vice Director will participate in the vote. Eddie Manley, K5EMS, our State Government Liaison , has informed me that as of 3-25-2013 our legislation changng the wording in our state PRB-1 law has passed the House floor vote unanimously and has been passed out of committee in the Senate. So, it's looking like it's gonna get through unless something big comes up. I am proud to let you know that the section now has an Assistant Section Manager for Youth. Conner Keef, WX5CJK is a meteorology student at OU and will be working with the youth of the section. He is being assisted by Megan McCellan, K5MEM past North Texas ASM for youth. They are planning on having a Youth Lounge at the sections 3 larger hamfests this year starting with Green Country, then Ham Holiday and ending with Texhoma. The youth lounge concept has really started to catch on. This way, any kids that come to these hamfests, licensed or not, will have programming aimed directly at them. The youth lounge at Green Country got the ball rolling. Both of our ASM's for Youth Activities couldn't attend for family reasons. However, Gary Way, AE5OF of Meeker, picked up the ball and ran with it. Gary got 2 eagle scouts to take over the booth for Conner and Megan. They did a wonderful job. Don’t forget the ARRL Centennial is coming up in 2014. By the beginning of 3rd quarter this year you should start seeing ideas for your club to start the planning process for next year. If you aren’t a member of the aresoklahoma or OKtraders Yahoo groups, then you should be. Also check out the section presence on Twitter and Facebook. Then make sure you join the ARRL-OK section e-mail list at http://mailman.qth.net/. That’s all for now. I hope to see all of you at one time or another this year. 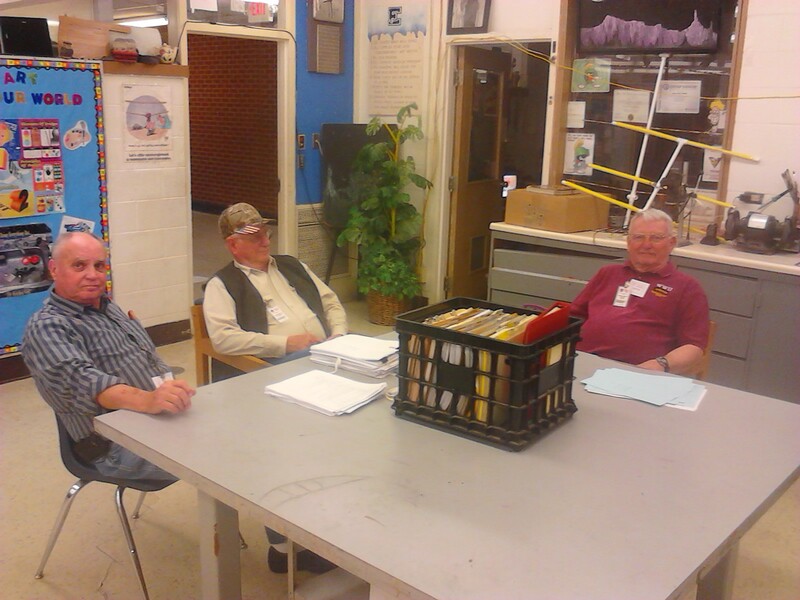 Tri-State Amateur Radio Group (TSARG) is hosting a "Ham Cram" in Woodward, OK. I am NOW taking registrations for a 1 Day ONLY, ENTRY-LEVEL (Beginners) - Amateur (Ham) Radio License Class and Exam. On Saturday, April 20, 2013. Format will be an ALL DAY class, where we will take you through the learning materials, and help answer any questions you may have. The day will conclude with YOU getting your Amateur Radio License Exam THAT AFTERNOON. 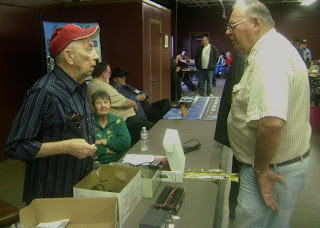 Spend a day learning and making new friends and walk out with your "Amateur (Ham) Radio License". We provide instruction, AND discussion. ALL REGISTRATIONS AND FEES DUE ASAP. REGISTRATIONS WILL CLOSE ON FEB 2ND !! Invite anyone you know that may be interested !!! Spread the Word !! NEW Ham Pack for ALL registered participants, and lunch is provided. Please Register ASAP, as VERY limited places are available. Clifton's art classroom, full of students about to take their test, the end result will prove to be one upgrade to General and three new Technicians for the 80 that will have tested, for a program total of 30 licensed students in four years. We have only achieved results in the last two years. Bringing young hams into the hobby is difficult enough when dad or grandpa is the mentor. Imagine the challenges when there is no family connection to amateur radio. Our commitment to the students is huge and there are many volunteers supporting the program to help make it work. When we discuss activities to maintain the student's interest, we talk in terms of years. Of course the best part is the fun we have in working with the students. the violin in the school orchestra. Thanks to Paul Goulet, KC5CYY for this information. moment for an eye-ball QSO. to new friends made, contacts all over in the Eyeball to Eyeball QSO's. Feeding time with some great Stew, and then a test session"
Next weekend is the big Green Country Hamfest in Claremore. Thanks to Ron Roman, AF5AS for the report and the pictures. The Tri-State Amateur Radio Group held their first annual Amateur Radio Ham Fest. Approximately 40 people attended to visit with Kevin O’Dell, Section manager for Oklahoma Section and Eddie Manley, the State Government Liaison. 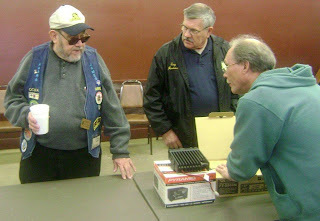 Jay Kruckenburg, K5GUD, Secretary/Tresaurer of Tri-State, setting up his table. 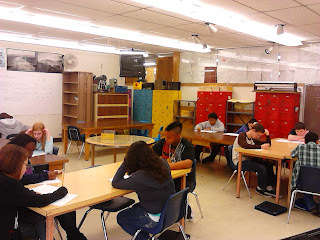 Thanks to Melissa Wilkerson, KE5BJO, for this report. present the 40th annual "Ham Holiday 2013" at the Bricktown Hotel/Conference Center, I-40 & Martin Luther King Ave., Oklahoma City July 26-27. PLEASE NOTE, THIS IS A NEW LOCATION!!! Doors open on Friday, 26 July at 3:00 - 7:00 PM and Saturday, 27 July 8:00 AM - 3:00 PM. Technical and nontechnical programs, DXCC/WAS card check, VE testing, flea market is part of the program. Preregistration $8; at door $10; flea markets $10/table in advance; $15/table at door (if available). Online registration available in mid-April!! Under 16 yrs of age free with paid adult. Additional information and registration forms available on the CORA Web site. Editor's note: Please look forward to additional announcements, including a prominent amateur radio equipment manufacturer as speaker.